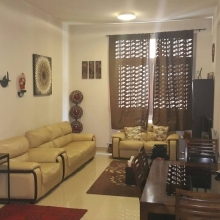 Al Jazeera Service Apartments Doha provides a comfortable setting when in Doha. It also offers a 24-hour reception, a currency exchange and an express check-in and check-out feature. This 3-star property provides room service, a laundry service and luggage storage. It also offers connecting rooms and a lift. Each apartment at Al Jazeera Service Apartments provides a refrigerator and all the necessities for a comfortable stay. They provide a private bathroom, ironing facilities and wireless internet access. Those staying at Al Jazeera Service Apartments Doha can sit down to a unique dining experience at the in-house restaurant, conveniently based for those who want to stay nearby when looking to sit down to a meal. Doha's well-known attractions and landmarks are within close proximity to Al Jazeera Service Apartments, with Qatar National Library just a 10-minute stroll away. Souq Waqif is within walking distance.